Well the weekend of August 10th mama Sasha finally blew her post-pregnancy coat! Sasha did blew her coat right about the time the puppies were 10 weeks old (6 months ago) and she really lost too much fur then which the vet said was normal due to all the raging hormones fighting in her body at that time. This was the first full-normal blow since the puppies were born and weaned. Sasha also gained an enormous amount of weight during her gestation and the pups weaning, she went from about 45 lbs. to 67-69 lbs. at her peak weight. During weaning she gained back all the puppy weight she lost during the delivery. We have been fighting hard since then to get her weight under control - with our vet agreeing that she should lose at least 7-12 lbs. and us wanting her to lose more like 12-18 lbs. at least. Sasha, and all our Sibes, eat a diet based on BARF and some lightly cooked meats with raw or lightly cooked vegetables added in and sometimes fruit or vegetable pulp leftover from juicing. We also give our Sibes daily supplements of Zinc (25 mg.), Vitamin E (400 i.u. only every other day), Garlic Extract (equivalent 600 mg. Garlic), and Flaxseed Oil (1,000 mg.). Because of the raw bones we seldom need to add supplemental calcium to our Siberian’s diets. I have included 3 shots showing how we use human men's combs to remove almost the entire blowing coat in just one setting, we don’t use normal pet brushes since they are fairly ineffective in our experience. Picture # 1 shows Sasha after we combed out about 1/4 of her right side. Let me point out again – we purchase a large bag of men’s plastic combs (assorted) at the dollar store for $1, which usually provides 20 combs. These plastic combs are normally only good for one combing session and then go in the trash, but since $1 will normally comb out all 4 of our Siberian Huskies – who cares about the loss of one comb per session? 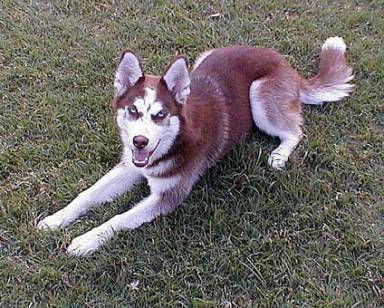 Sasha is a short-coated smooth red/white Siberian Husky. You can see the shine in the healthy old coat that is ready to blow. Within a few weeks the new coat will darken and gain back much of the luster of the old coat (and some length as well). As you can see much of the red colored coat that has blown leaves just new speckles of colored coat and white undercoat beneath. Normally, provided the coat is loose enough, we can simply place the comb at the base of the hair shafts and pull out small clumps. When tangles or hair that isn’t yet loose enough are encountered we fall back to using the comb on the ends of the hair shafts and work back toward the base of the hair shafts. We start this entire process by selecting an area where the hair has already fallen out since that area should be completely ready to blow or has already started to blow on it’s own. Then we work out in larger and larger circles from the center out removing hair clumps. You can see that the hair on the back of the hind legs, tail, and later the head and neck are normally the last areas to blow and so may not be ready to fully comb out yet. That is one depressed looking pup isn’t she? For Sasha this part is NO FUN at all, but being a well behaved young lady she always listens and waits for the process to be over. Picture # 2 was taken after we had combed out about 2/3 or her right side (notice we put down a big fabric drop cloth to cover the entire great room floor when doing this). We then give warm/hot baths on 2 consecutive days after this combing process and then repeat the combing with the hair damp/wet to insure maximum removal of the rough blown coat. As the photos show most of the blown coat comes out during the first combing. You may think that some skin is showing here, but it isn’t (unlike the last blow). There is a good healthy new undercoat beneath the entire blowing coat, shine and color are somewhat lacking but that comes later. To go from picture # 1 to picture # 2 took about 15 minutes. The entire first combing process takes a little over 2 hours per adult Siberian Husky on this first comb out. This IS NOT a favorite past time for any of our babies – they actually prefer the bath to the combing. Subsequent combings (dry or wet) seldom last more than 15-20 minutes. A normal blow takes 4 combings over 2 days to remove almost the entire old coat. We use a homemade shampoo that we make with Pert (conditioner and shampoo in one product) or Pert Plus (if dandruff is evidenced) and add in about ½ - 1 cup of raw oatmeal. We let this mixture set overnight to totally incorporate the oatmeal. There are similar dog oatmeal shampoos commercially available; we just think they are too expensive. I get in the tub myself when bathing each Sibe – it sets their minds at ease and you will be wet either way at the end of the bath. This also ensures that I put in water that is only as hot as I can stand it and not too hot for the Siberians. Hot water stimulates release of an enzyme in the blood that causes the old coat to blow. Simple hot temperatures will also increase this enzyme but moist heat (like a warm/hot bath) is better at stimulating the coat to blow. When bathing our Siberians we always ASK them to get in the bath – never order them. We also have treats on hand to reward good behavior. Once the dog is in the tub we have them lay down to thoroughly wet the coat. We keep a plastic pitcher in the bathtub and add about ½ cup of shampoo then several cups of bath water to dilute the shampoo. We never put full strength shampoo on our Siberians since this can cause skin irritation. We work up a really good lather from head to tail and then give a bath massage – both to work in the shampoo/conditioner and too loosen up any more blown coat that is stubbornly holding on. We message, message, and message then rinse, rinse, rinse and a final message, rinse, message to complete. When we are done we have one very relaxed Siberian with an outstandingly clean clear coat. Leaving the Sibe with a damp coat we do a final comb through – and then it’s off to freedom and a dry-out in the backyard. You wouldn’t believe all the happy happy dancing and prancing after a morning or afternoon spent doing this! In Picture # 3 you can see our new "skinny girl" revealed (she is watching a pack wrestling match) - notice that she lost much of her red hair and is a kind of light red (pink almost) color now. These pictures were taken 9 days after the first 2 shots. The color is returning and so is the shine. Sasha tends to blow her colored hair every time she blows her coat - none of the other Sibes in our pack blow that way, but some of the puppies placed with other members have shown similar traits of blowing lots of colored fur during each blow. Anya did lose a lot of her colored fur a while back, but didn’t actually blow her coat so we don’t’ count that. Within 1-month Sasha’s full coat length and shine will have returned. 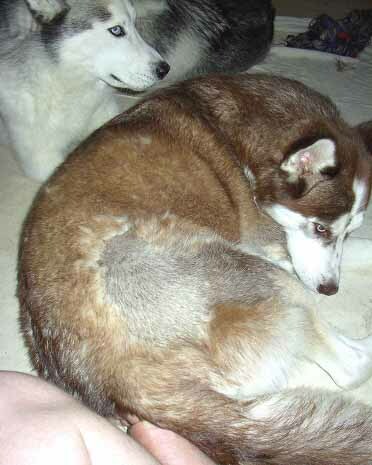 Since we live in North East Texas and have very hot summers and warm winters – our Siberian Huskies have a tendency to replace each blown coat with a lighter less dense coat. 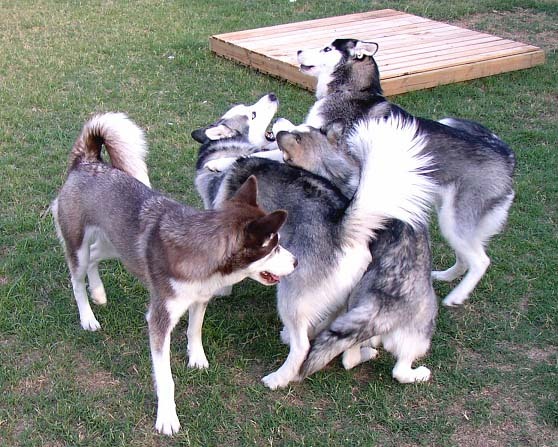 By about age 5 most of our Siberians never replenish the original heavy coat common to most northern raised Sibes. Niki, unlike Sasha, is a medium-long rough-coated Siberian. Though it’s hard to tell Niki’s coat is now much less dense than in previous years. Niki will be 5 years old this Fall. The Sibes in the picture on the left are (from left to right) mama Sasha, daddy Nikolai, baby girl Anya, and baby boy Alec. Yes I know those certainly don’t look like babies to you do they? Well they are still babies to me…… Daddy Niki never used to be able to play like this since he perceived wrestling as an aggressive behavior. Now Niki plays freely with the puppies most any time – as long as no treats are involved, and he understand play and subservience for the simple things they truly are rather than then aggressive things they are not. Sasha is now down to the low 50s in weight and we hope she can still shed another 5-7 lbs. I know some of you may think she is too skinny - but if you were to examine her you would notice that she still has some fatty tissue hanging from her chest to her groin (no it isn't breast material, mostly fat deposits). Sasha's energy levels are fantastic and she is the definition of vitality - gone are the minor bouts of anemia she had while weaning the puppies and shortly after that. 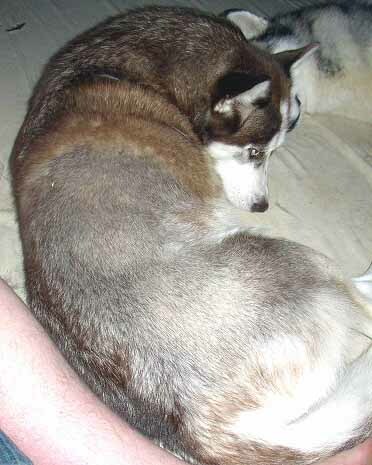 I have included, for comparison, a 4th Picture taken about a year ago when Sasha was just 42 lbs. (and still hadn't grown into her ears) - even at that age she was starting to show some spread on her hips, which greatly helped when the puppies were born but was a liability after the weaning was done. Several members asked how we handle blowing coats - this gives you an idea. Niki has just started his blow, but much of his coat is still firmly attached so I don't know if we will give him the same process this weekend or next. Anya, at 8 months, is just now showing signs that her coat may be about to start the blow - but by the looks that may still be a few weeks away. Alec, also 8 months, isn't even close to a blow yet. Enjoy the BLOW – we certainly have……….